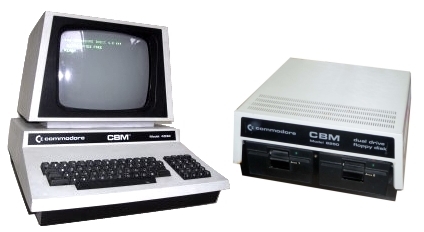 Commodore PETs initially used compact cassette tape for loading and saving programs and data, later machines used floppy disk systems such as the 8250 twin DS/QD 5.25" disk system that I obtained with my PET, shown in the photo above. 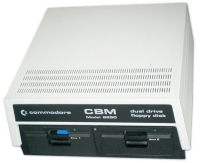 The 8250 uses full height drives and a format unique to the PET - the drive cannot even read or write disks from other Commodore disk systems such as the 1541. Quoting from Nils' webpage, "A petSD is a modern mass storage solution for Commodore PETs with an IEEE-488-bus. It can be used instead of and alongside vintage floppy disk drives. The petSD makes file sharing between the PET and the PC easy by using standard SD cards for storage." 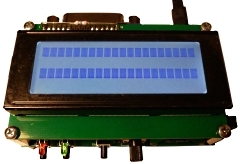 Further technical details can be found on my petSD+ Hardware page. Note: initially, petSD+ was not designed to be used with devices equipped with a Commodore serial bus such as the Commodore 64, there were already a number of compatible devices available such as MMC2IEC, SD2IEC or uIEC and Nils had not envisaged anyone wanting to use petSD+ with serial bus devices. However, after one user asked Nils if it were possible, Nils included an IEC option in the firmware - see here for details. 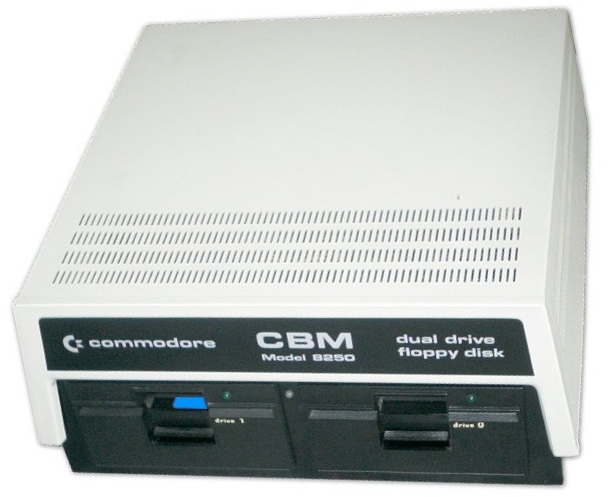 In order to use petSD+, or indeed, any IEEE-488 disk drives, the PET/CBM computer must have a BASIC 2 or BASIC 4 ROM, the earliest PETs with BASIC 1 do not support IEEE-488 disk drives unless the ROM is upgraded to a later version - preferably BASIC 4.
petSD was designed to be constructible by the average electronics hobbyist, and one of the design goals was to be able to use through-hole-technology (THT) components, rather than surface mount chips. The one exception was the FT232RL USB-serial-adapter for which a THT equivalent was not available. The USB - serial adapter has been dropped from the petSD+ design, the only surface mount component remaining is the SD card reader. Assembly of the petSD+ kit is described on the Assembly page. When I asked for input on the prospective supply options, based on the limited number of responses, supplying a kit of parts seemed to be the most popular choice. I decided that I would make kits available, as well as pre-assembled units for folks who need one. In practice though, once the kits and pre-assembled units became available, the majority of people wanted a pre-built one. A modified version 2 petSD+ has now been designed by Nils, read the details of the modifications here.